American coach Mike Brennan and junior guard Sa’eed Nelson spoke after American’s season came to an end with a 60-56 home loss to Navy in the quarterfinals of the Patriot League tournament. Navy head coach Ed DeChellis and center Evan Wieck spoke after Navy’s 60-56 win at American to end the Eagles’ season. See below for full video. Crespo and Jake dissect the end to American's up and down season, a 60-56 home loss to Navy in the PL Tournament quarterfinals. 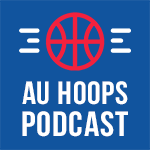 The fellas break down AU's offensive struggles, look a bit at the big picture, and offer some optimism for the future as well. Mike Brennan spoke ahead of American’s Patriot League quarterfinal Thursday vs. Navy. See below for full video and select quotes.